Monica has a degree in Telecommunications Engineering from Spain. Through the Erasmus exchange programme Monica spent the last year of her master programme at DTU in Denmark where she also wrote her master thesis. During her master thesis on detection of foreign objects in food, she got to know the Image analysis group from DTU Compute which she is working together with today at her PhD. 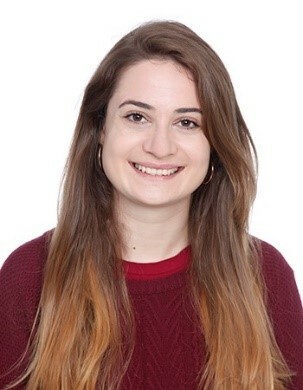 In her PhD, Monica is using X-ray tomography to scan materials reinforced with fibres at a micro scale, where individual fibres are distinguishable. Primarily, Monica is studying materials used in wind turbine blades such as glass and carbon fibre reinforced polymers. She is trying to characterise these materials to better understand their behaviour at the macro-scale, which is highly determined by their internal structure. In the process of understanding these materials and the fibres inside the materials, Monica mainly focuses on the maths, statistics and computer science – when all the required images are acquired with X-rays, Monica analyses them. “We are trying to learn better how the material breaks and why it breaks, whether it depends on how aligned the fibres are, where they are placed or how big they are”. In addition, a better understanding of the relationship between the mechanical properties and the internal micro structure will enable more accurate predictions of the lifetime of the materials used in wind turbines and air planes. Monica explains that the estimated life time of a wind turbine blade now is 20 years before it is replaced by a new one – but without a scientific reason. By investigating the materials in wind turbines, it is possible to document for how long the material can last although the material is a bit damaged – which in theory could 40 years: “So, if we know these materials better we can design blades which are longer lasting”. Monica has already gained some valuable insights about the materials she is studying. When the fibres are compressed, the fibres first bend and then break and Monica’s study shows that is it possible to predict in which direction the material will break. This knowledge is quite useful when producing new and stronger materials with a prolonged lifetime. In her MAX4ESSFUN project Monica was collaborating with her co-supervisor, Leif Asp, from Chalmers University. The collaboration with Leif gave Monica and her group the opportunity to study fibre composites at a broader scale, where fibres are arranged in bundles. The reason for this is, that Leif and the other scientists from the Chalmers team is interested in the fibre composition on a broader scale where the fibres are grouped in blocks of fibres. Studying the fibres on microscale and on a broader scale give different information about the materials and both things are important. Additionally, in the MAX4ESSFUN project Monica was studying similar fibre arrangements and materials as in her PhD but focusing on samples under load. In particular, she analysed a time-lapse X-ray image sequence of a glass fibre composite loaded in compression. Her software made it possible to measure and document each step of the fibre structure in 3D and follow the very small and sudden micro-structural changes when the material is under load. To develop a software, Monica explains, you first have to talk to the scientists who will be using the software to match expectations: What is their current problem and needs and what do they want to find out using the software. After the conversations, Monica investigated different methods and choose a segmentation method which she started applying on data from different scientific studies. After a while she started extending this method to become applicable to the fibre case. The software functions as a machine-learning-algorithm which Monica has trained to know what is the centre of a fibre and what is the background of a fibre to recognize the patterns and shapes of the fibres. Because different materials have different density and chemical composition it is possible for the software to separate different materials from one another and find the geometry, the position and the size of the fibres in images: “We are training the algorithm by manually pointing out where the centre of the fibres are, and through this the algorithm learns how to model and recognize where the fibres are”. Monica and her collaborators have performed scientific experiments at the synchrotron X-ray facilities in Grenoble and Switzerland. For Monica’s kind of study, Synchrotrons are essential because the technique makes it possible to see very fast changes in high resolution which is not possible in an X-ray laboratory set-up: “X-ray tomography can provide great insights about the materials behaviour under load – with high-speed imaging it is possible to observe the very fast and sudden micro-structural changes in 3D”. The synchrotron technique makes it possible to scan and document the structural changes which happen when a sample is affected by external forces, similar to the ones which would happen in reality. Monica explains: “It is possible to change the environment where the sample lives, to change the temperature, compress the sample and then scan it while the structure changes. In particular we followed fibre bending under compression loading”. Due to the MAX4ESSFUN programme, Monica has met young scientists from Chalmers university and scientists from the industry, which she otherwise would not have been in contact with. According to Monica, the collaboration with Chalmers can result in an expansion of her software tool; it is now also applicable on fibres at a broader scale. Furthermore, the network has also been useful in the way that Monica’s software is being promoted in Sweden. Finally, the MAX4ESSFUN program has contributed to broadening the knowledge about ESS and MAX IV and what kind of research the facilities make possible: “I think it is very important to have cross-country and cross-regional collaboration in general. The Interreg collaboration has definitely meant that our software solution is now used by more scientists outside of Denmark. Furthermore, the Interreg project has also broadened the knowledge about the research facilities, what the possibilities are at the facilities and how the techniques available can contribute to better and more efficient science”. Monica has been offered to continue her research in the same field. If Monica continues her research and the study of microstructures of materials with X-rays, she wants to study other types of samples, e.g. food, to study how and why the food loses properties if it is boiled or frozen, or biological and medical tissues, to better understand the functioning of our body.